Welcome to Bayou Village Vacation Rentals by Owner, where some of the most beautiful homes are located and provide you with amazing scenery due to the convenient location. Bayou Village gives you the opportunity to make the most of your vacation in any way you desire. Enjoy a relaxing vacation by lounging around the house, laying on the beach or even going to a local spa. A few of our favorite spots to eat at are Pompano Joe's, Dewey Destin's Seafood and Restaurant, and the Back Porch Grille! Joe's offers a Caribbean style seafood with a gorgeous view, Dewey's is a lively scene with great eats and the Back Porch Grille serves grilled seafood along the coast! If you're looking to make this trip full of fun and activities, we highly recommend you take part in parasailing, deep sea fishing, paddle boarding, boat tourism, golfing, bowling, water parks, rock climbing and so much more! A great place to shop and check out a few traditional restaurants is the Destin Commons! Not far from Bayou Village, this outdoor mall offers chain restaurants and a World of Beers, enjoy any beer you can think of! Browse our selection of Bayou Village listings below. Be sure to click on the EMAIL OWNER button found on each listing to contact the property owner directly. Booking direct with the owner is the best way to assure you are not over paying for your rental. Book online today with Emerald Coast by Owner and save! 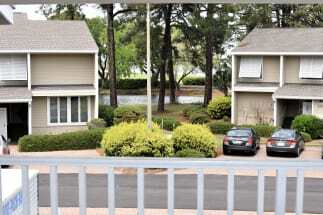 2 Master Suites and GOLF CART!